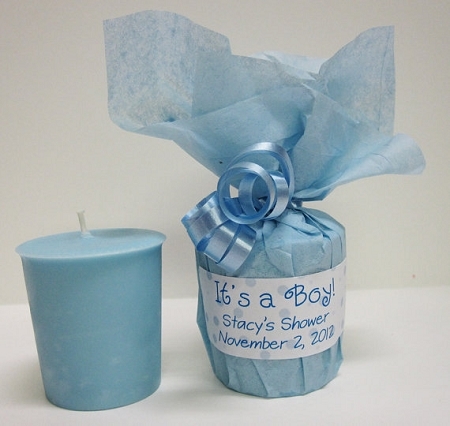 $2.25 each, these adorable It's a Boy baby shower votive favors are sure to be a big hit with your guests. Favors are made to order in quantities of 5. Each 100% soy votive is scented in our Lullaby scent which is a delightful baby powder scent. Votives are blue wrapped in matching blue tissue paper tied with blue curling ribbon. Blue polka dotted label on the front reads "It's a Boy" and can be customized with the name of the Mommy and her shower date. Favors are made to order in quantities of 5. See our other listings for Its a Girl and if you don't know what the baby is going to be we offer generic yellow favors. We can make any combination of colors and scents just contact us and we can create a custom favor for you.